Will Avila is a Growth Driven Design and Inbound Marketing expert at Rizen Inbound. Research in human behavior and neuroscience is helping marketers create content that performs better overall; increasing engagement, leads and conversions for marketing campaigns. A reader usually knows within seconds if they’re going to pay attention to a landing page, finish reading a press release, or read a blog entry in its entirety. Science now shows us what elements those pages have that can mean success or failure for that piece. By understanding neuroscience and how the brain works, you can create content that appeals to people on a very primal level. The first thing we need to understand is our reptile brain. 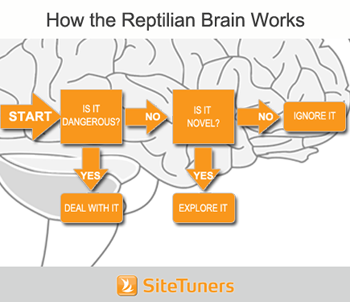 In popular culture the reptile brain is heavily simplified. But understanding it (even on a basic level) can help you create incredible content. 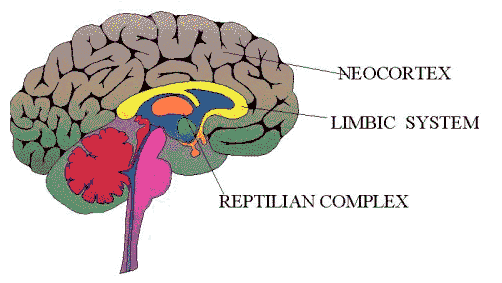 In the general sense, the reptilian brain refers to what would be considered instinctive or more animalistic behaviors. Emotions such as anger, pleasure, fear, ritualistic displays, and the concept of “your territory” are all associated with the reptile brain. When it comes to inbound content marketing, the idea is to engage these base‐level emotions to capture the reader’s attention. People give special notice to things that grab their attention very quickly and without much thought. Say you, a woman, are turning a corner, and see group of men walking towards you nearly one block away in a residential neighborhood. They could just be a group of guys going to play basketball at a nearby park but regardless, you reptile brain will trigger an initial reaction of fear. With an advertisement, blog title, landing page, or infographic you should be stimulating the reptilian complex to grab someone’s attention first, to better improve your chances for engagement, leads and conversions. Emotions of the reptile brain are those of instinctive response. For example, your survival instinct. You don’t have to give much thought to pulling your hand away from an open flame, it is an instantaneous reaction. 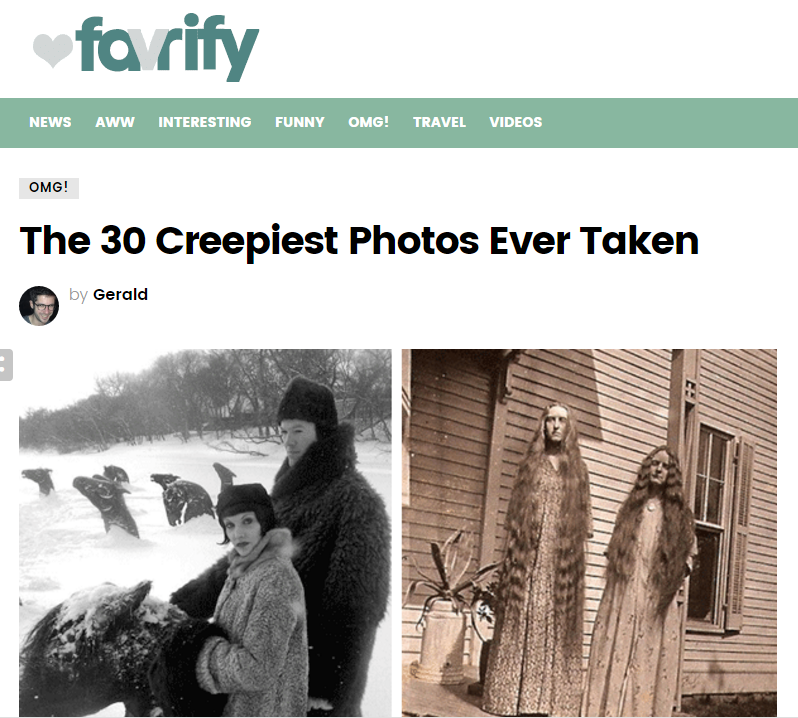 You probably don’t have to scare a person when you write content usually but if you can, by all means do it. 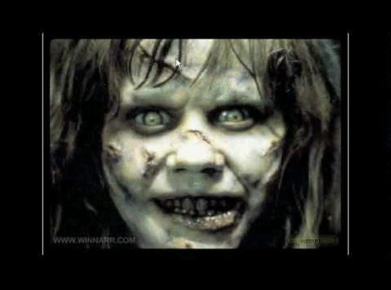 I guarantee this picture triggered your reptilian brain. I’ve basically captivated you for a brief second and you should think of ways to captivate your audience without using such a scary image. One good example of “scare marketing” are all the radio commercials, T.V. 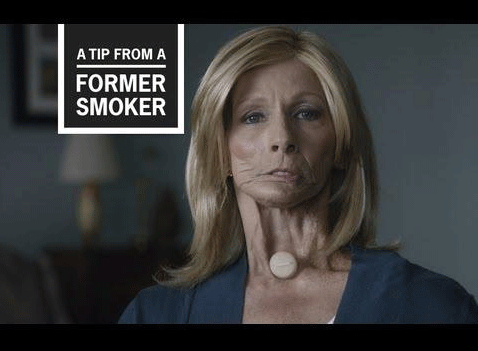 commercials and infographics speaking about the harmful effects of tobacco, which have made a large impact in reducing cigarette smoking year after year. Here’s a real world example of how effective the above can be. The FB ad campaign for the post used a particularly scary image and had a click‐through rate of 8.59%. This resulted in a CPC (USA traffic) of £0.003. That’s over 3 clicks per penny. So, yep, as grubby as it may seem — scaring people works. Aside from scaring a person, you can also make use of other emotions to captivate. I’ll go over different ways to captivate people below. The reason visual metaphors work so well is because human beings have a highly developed sense of sight. In fact the optic nerve connects directly to your reptilian brain, hence why your fight or flight response can be triggered by visual cues. When creating your content, you want visual elements that are unique and relevant. You can have excellent written content but if the first thing a reader sees is a cliche stock photo that’s been used one hundred times, you might have already lost them before they had a chance to read your great content. Make sure your visual images evoke the same emotion and have the same impact as your words do. Web copy is not widely read. 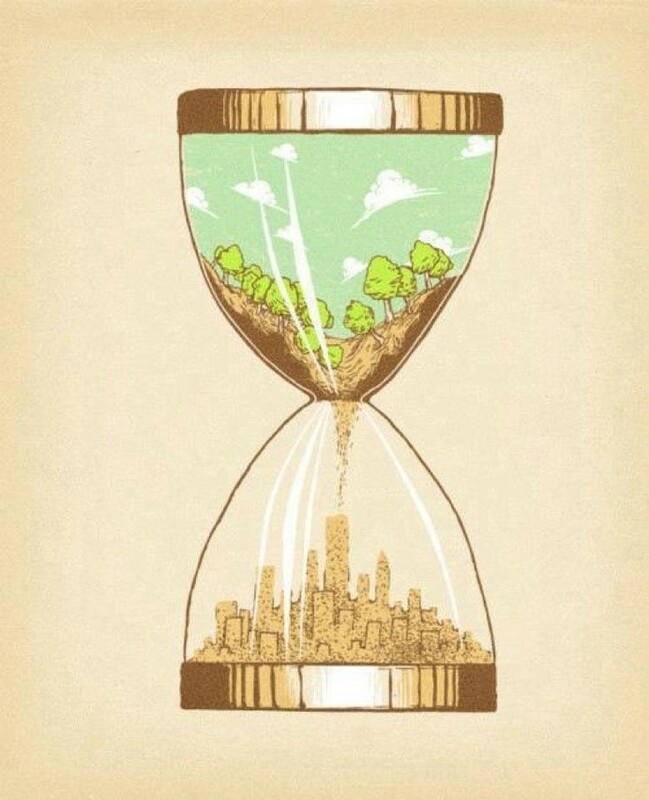 There are many things competing for our time and we are all busy. Because of this, visitors tend to skim over web copy instead of reading it in its entirety. They jump around, perform a quick scan of content to find the central idea behind the writing. To paraphrase research performed by Jakob Nielsen, only 16 percent of test subjects read web copy from start to finish like you would a book. By contrast 79 percent scan the webpage and look for specific words or sentences to get an idea about what is being said. How do you get around these fickle readers? Use bullet Points, Bold or H Tags and Headers for key ideas. It allows you to present an idea where the reader is more likely to see it. Also bullet points and headers tend to draw your attention due to having a unique format. Emotion drives many of our decisions. 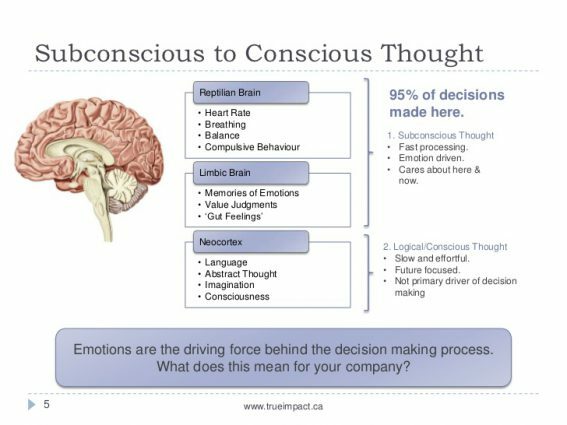 In fact, much of your decision making process is driven by the subconscious without the logical input from the cognitive parts of your brain. Think of your favorite color or certain car models you may find horrid to look at. There isn’t much logic that enters into these preferences, as people often like what they like without much thought of a logical explanation. 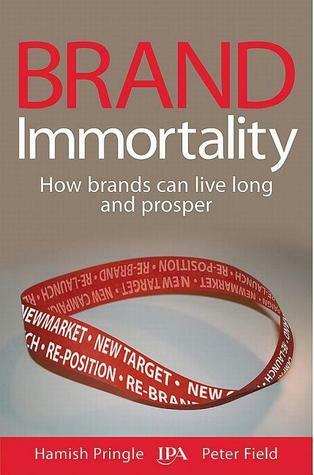 The book Brand Immortality by Pringle and Field presented interesting data in this matter. The data they collected came from the Institute of Practitioners in Advertising in the United Kingdom. The IPA’s research collected 1,400 case studies of successful advertising campaigns over the last 30 years. These advertising campaigns had been submitted for the IPA Effectiveness Award competition over those three decades. In terms of the profit they brought to their companies, advertising campaigns that were based on emotional appeals greatly outperformed those based solely on information. 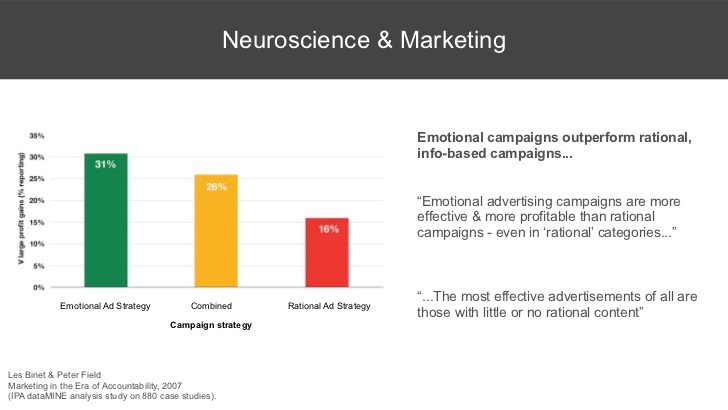 In fact, purely emotionally‐driven campaigns outperformed rationality‐driven campaigns at a rate of 31 percent versus 16 percent. Purely emotional campaigns also out performed campaigns that blended logic and emotion at a rate of 31 percent versus 26 percent. In Brand Immortality the authors attributed these findings to the fact the human brain responds more strongly to emotions than it does to logic. Also, emotional stimuli is quickly understood even without the complete awareness of the viewer. Key takeaway: Get an emotional response out of your visitors. The reptilian brain understands contrast easily. Contrast can be demonstrated with content in many different ways. Use words like “We are” and “We are the best” within your content so that you stand out. Things that are hard to read require more brain power and focus. You’ve likely seen a website or printed media written in an obscure or hard to read font. When people find something hard to engage with, they are less likely to do so. A study by Hyunjin Song and Norbert Schwarz at the University of Michigan also found there are underlying psychological effects. 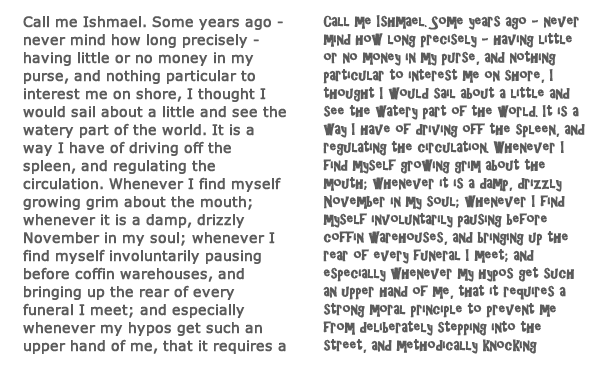 People associate a font’s readability with the content itself. Something that’s easy to read becomes associated with ease of use. 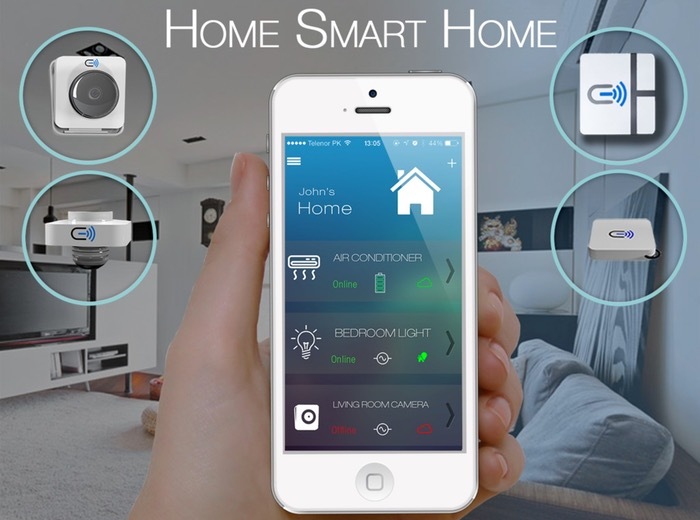 Plus the likeliness the reader will retain the material’s information or perform tasks it instructs in also goes up. Something that’s hard to read becomes associated with inaccessibility and being hard to understand. Also when presented in such a way, readers are unlikely to retain the information or perform any activities it instructs. I think it’s clear which font is best. Use common fonts. Save the fancy typography for wedding invitations or artwork. Headline writers like to play on common figures of speech and well known expressions. When writing these kind of attention‐grabbing headlines and changing a common phrase, make sure your wordplay is at the end. This gets a reader’s attention, as it goes against what they were expecting to read. When picking up on a pattern, your brain automatically fills in what should come next; a variation to this quickly grabs a reader’s attention due to a mental comparison being made between what was expected to happen and what did happen. b) gives the information in a logical structure (the list), which in turn has a higher probability of be clicked on and read. 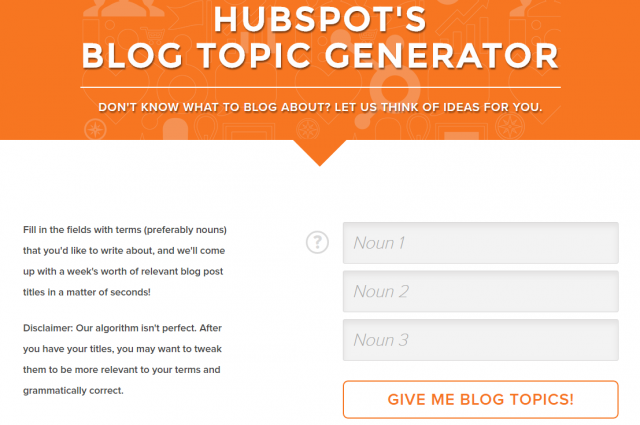 http://www.hubspot.com/blog-topic-generator — Easy to use, big library. So you’ve captivated your readers with a powerful headline and/or a great header image. It’s import to focus your key points at the beginning of the content and reiterate them at the end. In this article for example, I used numbered bullet points. You’ll notice that the beginning grabs your attention because it’s a kid dressed up as Darth Vader, but the ending is the icing on the cake because the kid actually believes he started the car. After your blog post, landing page or other content, you’ll want the visitor to perform a certain task. It could be to fill out a form, call you, or just share your content. If you want them to fill out a form, make sure the form stands out as much as possible. Have arrows point to your form. By being able to access subconscious reptilian emotions and understanding research done on how the brain works, you can create exceptional content that will lead to more engagement, links and even sales. Make a list of the above 1 — 8. 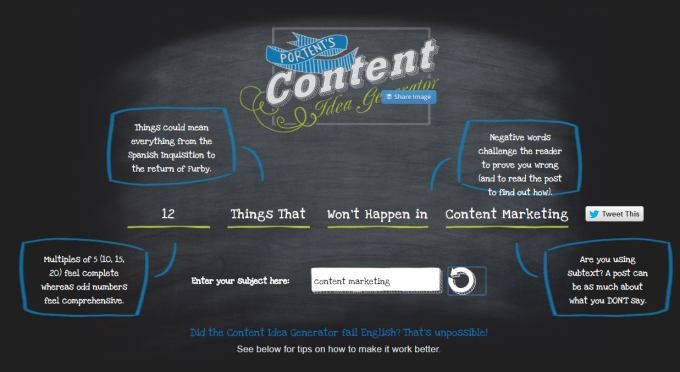 Read it prior to writing your content and after. 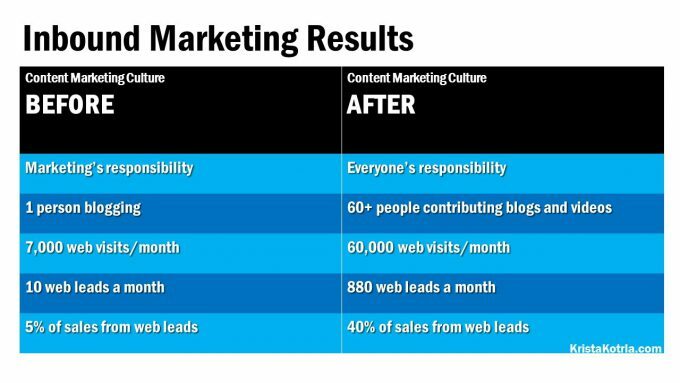 Follow these principles and your content will not only stand out but perform better; it’s science.